It’s only rock and roll… but I like it. Mick Jagger was both host and musical guest on Saturday Night Live this past weekend and, for his first number, he performed the Rolling Stones classic “The Last Time” while backed by Arcade Fire. It isn’t everyday you see the lead singer of the Stones shimmying with an accordion player (in this case, Arcade Fire’s Régine Chassagne), so savor this image while you can. Craigslist recently started producing a fun series of videos called Craigslist TV, which follows interesting posts from real Craigslist users and shows how their transactions unfold. In this episode, Robin wants to give away an old accordion… but there’s a catch. Whoever claims it must first play the accordion at a dinner party for her family. When three prospective “buyers” show up — professional Gigi, underdog Michael, and quirky Renee — an “Accordion Idol” competition is held, complete with a panel of judges to decide who gets to keep the accordion. Tune in for the feel-good story of the year. I’ll admit, I don’t watch a lot of TV these days unless it’s Sesame Street or baseball, so when a friend asked me if I watch Mad Men , I just shrugged and replied, “That’s the one with the guys in suits, right?” When his jaw dropped and he said, “YOU MEAN YOU HAVEN’T SEEN THE ONE WITH THE ACCORDION?! ?”, I figured I should probably catch up. 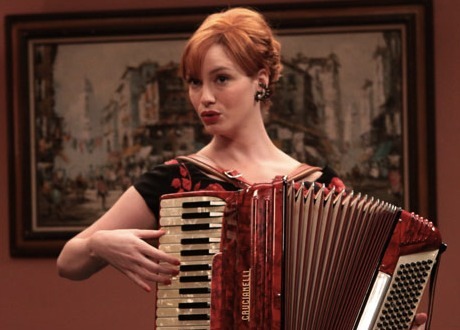 For an in-depth deconstruction of the Mad Men accordion scene, check out this essay from ethnomusicologist Meredith Aska McBride, who puts the performance into its 1960s context. As we learned while building our directory, accordion shops — particularly ones that only sell and repair accordions — are few and far between. So we were excited to run across this video promoting Main Squeeze, the colorful accordion shop on New York City’s Lower East Side. Run by Walter Kuhr, the store offers new/used accordions, repairs and lessons, and is home base for the all-female Main Squeeze Accordion Orchestra. Main Squeeze even has its own line of accordions, most notably the Model 911 — a compact 72 bass accordion made from walnut wood. Seems to a popular model as I’ve seen photos of a few artists using it recently, including John Linnell of They Might Be Giants. Move over ABBA; I have a new favorite Swedish band. Detektivbyrån is a folk/electronic Swedish trio with a penchant for whimsical arrangements and Amelie -inspired melodies. Like a music box gone wild, their instrumentals balance the sprightly tinkling of glockenspiel, bells, and toy piano with a boisterous accordion and occasional synthesizer. This video captures the band performing “Generation Celebration” from their latest album, Wermland . Last month, the American Accordionists Association held its annual festival in Memphis, Tennessee. The gathering featured performances by Riders in the Sky (with Joey Miskulin), Jeff Lisenby and the NashVegas Jazz, Tony Lovello, Bruce Gassman, Joe Natoli and Mary Tokarski. In between the concerts, workshops and competitions, a small band of accordionists made their way over to the King’s house for a little rock and roll… accordion-style.